Shockingly, very few laws protect farmed animals from abuse or neglect during their lives on factory farms. Standards are set by the industry itself, and compliance is voluntary. Consequently, bad has become normal and horrific cruelty has become standard. As our investigation shows, the egg industry is the proverbial fox guarding the hen house and is incapable of self-regulation. On any given day, many Canadians find themselves playing a game or two of Angry Birds on their iPads. But for millions of Canadian egg-laying hens, an iPad represents something entirely different: the approximate size of the floor space allotted to each hen for her entire life -- talk about an angry bird. Mercy For Animals Canada recently completed an investigation of two Canadian egg farms --Creekside Grove Farms in Spruce Grove, Alberta, and Kuku Farms in Morinville, Alberta. These two farms raise hens who produce eggs for Burnbrae Farms, Canada's largest and leading egg distributor and the exclusive supplier to McDonald's Canada for its Egg McMuffins. What the investigator documented is an outrage to compassionate Canadians: thousands of egg-laying hens crammed inside tiny wire battery cages so small they couldn't spread their wings, walk, or engage in natural behaviors; chickens trapped in cage wire, mangled by factory machinery, and suffering from open wounds without proper veterinary care; and workers smashing the heads of live chicks and then throwing them still alive and conscious into plastic garbage bags to slowly suffocate or into incinerators to be burned alive. Unfortunately, most of the investigative findings are standard practice for the Canadian egg industry. 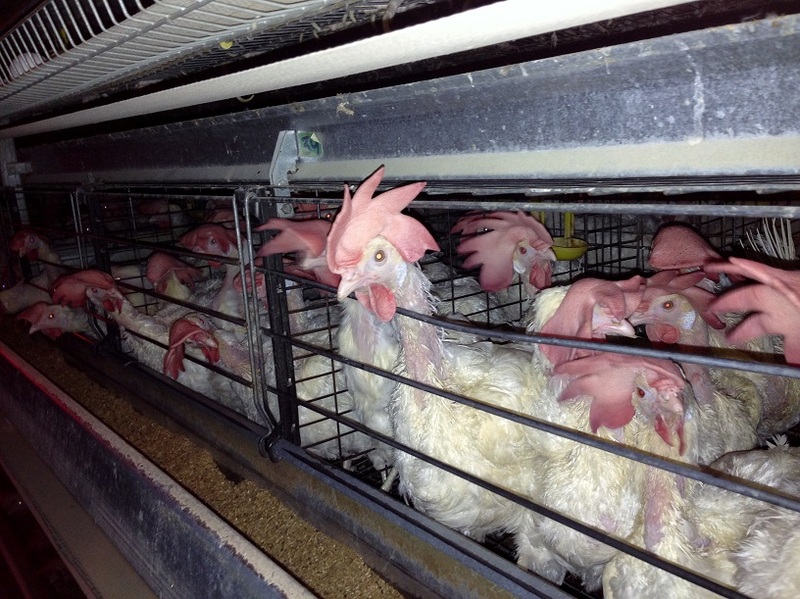 The vast majority of Canada's 27 million egg-laying hens live their entire lives in battery cages. Barren battery cages like these are considered so inhumane they have been banned by the entire European Union, Switzerland, New Zealand, and the states of California and Michigan. Chickens are sensitive, social, and inquisitive animals. Even after thousands of years of domestication, chickens exhibit the same behaviours and desires as their wild ancestors. They enjoy making nests, preening their feathers, and searching for food. Like us, chickens form friendships and have strong family ties. And as we all know from the earliest stories told to us, hens make fantastic mothers. Hens chirp to their chicks while still in the egg to coordinate hatching, and are fiercely protective of their young, even risking their own lives for their chicks. On factory farms, however, chickens never get to meet their mothers or experience motherhood themselves. From the time they hatch to the time they are killed, chickens are kept in unnatural groupings in crowded conditions, unable to explore or interact as they naturally would. In the barren and restrictive environment of a wire battery cage, unable to express any of their natural behaviours, the animals suffer from extreme physical and psychological trauma. Animal welfare experts agree that the conditions documented in the two Alberta factory farms are deplorable. Dr. Sara Shields states: "The video footage demonstrates the unfortunate way that hens are treated as mere units of production. These egg production operations are in serious need of reform." Dr. Ian Duncan, Canada's leading authority on poultry welfare and professor emeritus in the Department of Animal and Poultry Science at the University of Guelph, concurs: "It is obvious that these birds were not being inspected frequently enough. The high number of trapped, sick and injured birds in the cages, as well as those forced to live on the manure belt, is unacceptable." While we'd all like to believe otherwise, the cruelty uncovered by our investigator isn't just a case of two factory farms failing to meet industry standards. It's a case of industry standards allowing for unconscionable animal abuse. The practices exposed at these two operations are representative of those carried out behind the closed doors of factory farms across Canada. Shockingly, very few laws protect farmed animals from abuse or neglect during their lives on factory farms. The government does not regulate or oversee farming conditions. Standards are set by the industry itself, and compliance is voluntary. Consequently, bad has become normal and horrific cruelty has become standard. As our investigation shows, the egg industry is the proverbial fox guarding the hen house and is incapable of self-regulation. Ultimately, it's up to all of us -- citizens, consumers, and corporations such as McDonald's Canada -- to put an immediate end to this blatant animal abuse. No Canadian should support the intensive confinement of animals in cages so small they can't walk, spread their wings, or engage in natural behaviors. We all have an important role to play in creating a more just and compassionate society for Canada's farmed animals. Our collective voice is their only hope for a better future. To add your voice, visit eggmcmisery.ca.